The record uptake of subsidised rooftop solar power into homes and businesses in some areas is beginning to affect grid power quality and forcing policymakers to consider the unthinkable – the need to curtail flows of solar power into the grid. The grid hasn’t kept pace with the explosion of homeowners wanting to export surplus energy back into the grid, setting up a two-way flow the centralised networks weren’t designed for and reducing power quality. Poor power quality might mean that lights flicker or dim when an energy-hungry appliance like a pool pup is switched on. Surplus wind and solar power can also turn wholesale electricity prices negative, forcing high cost generators out of the market. 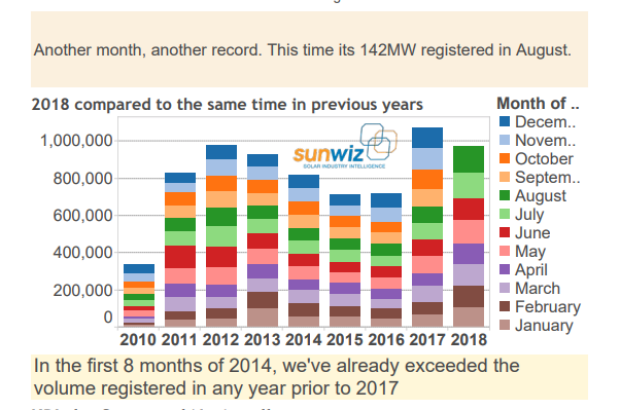 Solar rooftop installations hit another record in August, with 142 megawatts of small-scale residential and commercial systems coming on line, data from Sunwiz, a consultancy, shows. That lifted the total for the year to date to 974 MW, which is 49 per cent more than the same stage last year and not far shy of the full year record of just under 1100 MW in 2017. Solar installations hit another record in August, with 142 megawatts coming on line. Commercial and industrial systems larger than 100 kW are also booming among shopping centre owners Vicinity Centres and Stockland Group, manufacturers Liberty OneSteel, Primo Smallgoods, Hunter Douglas window coverings, egg farmers Pace Farms, and Brisbane Airport. 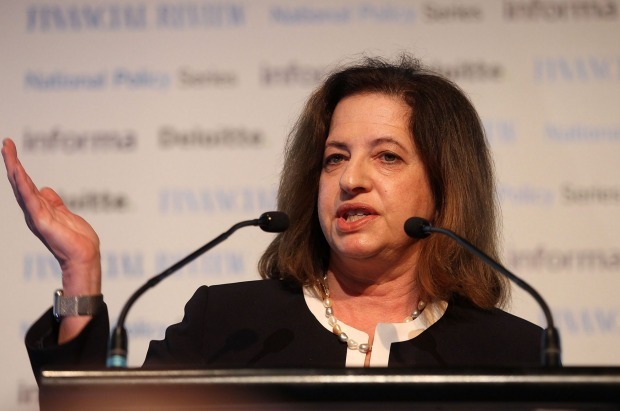 Australian Energy Market Operator chief executive Audrey Zibelman said curtailment – which already applies to wind power in South Australia about 6 per cent of the time – could also be required for rooftop solar as a last resort “in some instances”. But Ms Zibelman said AEMO is working to avoid this by better integrating distributed energy resources – including solar, batteries and electric vehicles “behind the meter” in homes and businesses – into the grid. It will run trials to get ahead of regulatory changes and is developing a register that will be in place next year to enhance visibility of distributed energy. “As with any form of generation where technical limits of the networks are exceeded, including both transmission and distribution, action is taken by the network operators and AEMO to address any risk” she said. “This may include modifying the control systems of the generators [including residential solar], changes to network configurations or equipment, or in some instances curtailing the generation source. Audrey Zibelman said curtailment of solar could be required as a last resort. Capacity in small-scale rooftop solar now totals about 7500 MW and commercial and industrial systems lift the total “distributed energy resources” to nearly 10,000 MW – just over one-sixth of system capacity. AEMO already curtails wind farm output in SA when surplus generation threatens system stability and says wind has been curtailed for about 6 per cent of the time over the past 13 months. It says it curtails wind in SA to 1295 MW if there is insufficient “synchronous” or spinning generation – which usually means gas turbines – online in the state. Trevor St Baker, who owns Vales Point coal power station in NSW, says wind curtailment should go further, so that “dispatchable” – or firm – generation is always at least 50 per cent of supply. “The extent of the problem is quite serious for existing market participants and new investors,” he says. Rooftop solar panels and batteries will exceed coal generation by 2030. 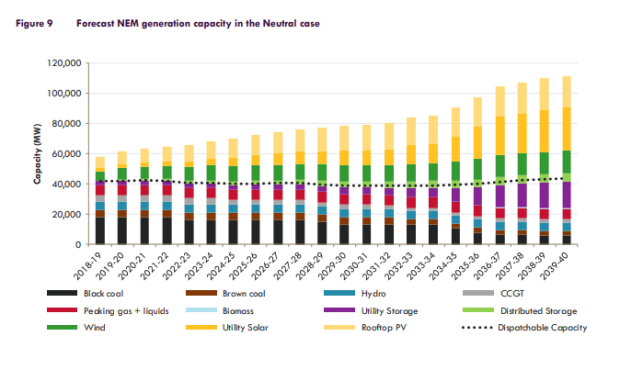 Energy Networks Australia chief Andrew Dillon said the issue of power flowing back to feeders is already happening in areas with high solar penetration, such as South Australia and Queensland, where solar penetration exceeds 33 per cent and 30 per cent. Experts say the practice should be a last resort for solar homes and businesses and there are better ways to manage the problem. “If there are investment flows into particular parts of existing grids that are not strong, there will be some curtailment issues. It’s about how we line up enabling investment in strengthening the grid with the new investment in generation that’s happening,” Mr Dillon said. ENA is working with AEMO on programs to better manage distributed energy. Frank Tudor, former chief executive of Horizon Power, a Western Australian-owned utility, said earlier this year that if solar and other distributed resources are well managed, they can be a solution rather than a problem and help to stabilise the system rather than disrupt it – a “cleverer way to deal with it” rather than rushing to curtail solar households. This is already happening in trials and small commercial deployments around the country. Vicinity Centres is trialling Power Ledger’s blockchain technology to get better data on how it is using energy and eventually to share power with neighbours, upstart retailers such as Powershop and software companies Reposit Power, Evergen and Greensync have deployed a “demand response” service which pay customers to curtail their own usage, send power from their solar panels, batteries and smart appliances back to the grid at times of high demand, and Queensland’s state-owned Energex uses demand response to tap customers’ pool pumps and hot water systems.